Does this really work that well with unmatched and not thermally coupled transistors? I would’ve used something like a BCM857BS. 3) there is not much current flowing, so not much heat-related drift, and the transistors are located close to each other. Most modern bench supplies have a high enough resolution, without spending much. Heck, even on my crappy home made analog supply i could get fractions of mA on a 5A range using 2 pots. Now on the circuit …. i highly call that precision. there is literally no precise element in the circuit. Well, if we are talking about “precision” and not precision…. I appreciate simplicity; I appreciate a good junkbox build. But I’ve really gotten tired of the whole coarse/fine dual pot thing. We have some very expensive power supplies at work, yet the manufacturer chose to cheap out and use two pots for voltage and current limit. Ten turn potentiometers are a FRACTION of the cost that they used to be. About $2 each if you buy 5 or 10 at a time. How constant is the output over what voltage range? yeah but try quickly going to full scale from zero with a 10 turn pot. Is that really a factor? If I need a step change in current, I’d install two 10 turn pots and a switch to flip between them. Sure, but single turn potentiometers are also cheaper. I would say 2 are still cheaper than am multi-turn. Yes, I too would prefer a multiturn, but they are not always the best solution. I’m expressing my preference. I would rather use a 10 turn pot than two pots. One less knob, inexpensive 10 turn pot, not sure the difference in price is significant. Yes, exactly. My comments were in no way meant as a criticism. Noob question: Since it is powered by a 9V, I assume max V to be <= the battery voltage (or maybe strictly < Vbat due to voltage drop across T1?). What is the lowest voltage this device can supply? I suppose that probably doesn't matter since the purpose is current limiting and the voltage will be the max (up to the limit asked about above) required to deliver the desired current. You know the U=R×I law, the rest follows. 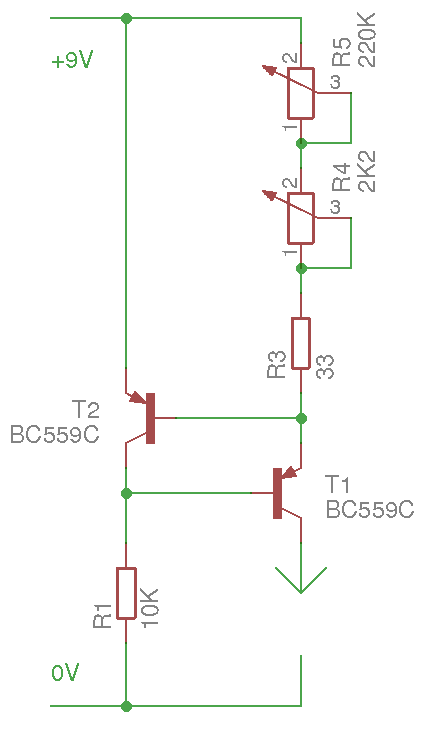 https://cdn.hackaday.io/images/162931531433094650.png shows the principle : the max voltage is determined by the battery, minus the drop across R3+R4+R5, which is held at 0.6V by the feedback transistor T2. When saturated, the drop across T1 is not significant. In practice, that would be (a bit more than) 8V, which is ok since I don’t think I’ll exceed 5 or 6V. There is no real minimal voltage, since T1 will adjust the output voltage, up to its maximum rated Vce. Neither transistor should be in saturation. The gain drops significantly at saturation. I would expect to lose two diode drops plus a bit more. The Vbe of each transistor. Current regulation would be expected to suffer a bit as you approach two diode drops below the battery voltage. Whether or not that is significant depends on your needs. In any case, if more headroom is needed, a second battery could be added in series as long as the transistor’s rating is high enough. I’ll have to measure at various currents to confirm everything but it seems that at low currents, it’s close to 0.6V and not two diode drops.